Recently, I was a part of a huge Charity Buzz auction to benefit Plastic Pollution Coalition. Plastic Pollution Coalition is an organization aimed at eliminating single-use and disposable plastic's toxic impact on our world and ourselves. I was honored to be listed on the auction with other PPC supporters like Jackson Browne, Ben Harper, Linda Ronstadt, and Ed Begley, Jr. We all helped to raise thousands of dollars for this important cause. With Halloween coming up at the end of the month, I've been thinking about how we can all start reducing our plastic footprint. All of my key staff are LEED certified designers, and we strive to implement sustainability and energy efficiency into our design projects. The holidays are a great time to be eco-friendly, and especially Halloween - the worst for throwaway plastic candy wrappers and costumes! Here's a quick list I got from my friends at Plastic Pollution Coalition. 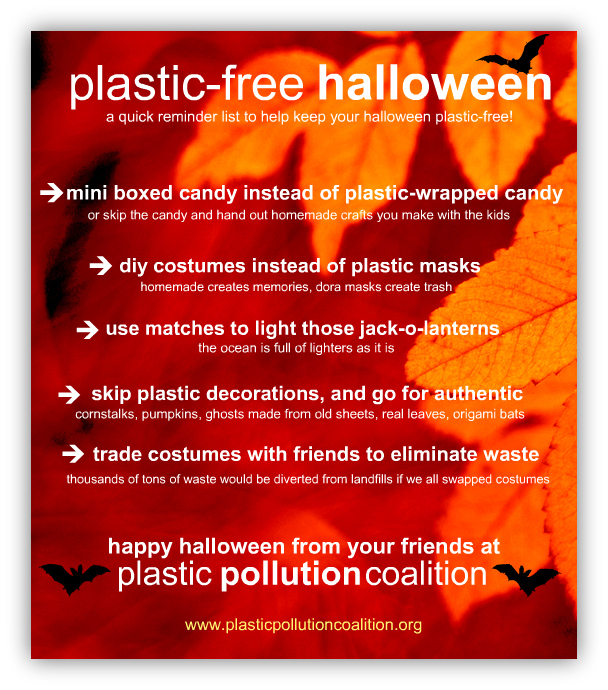 Be sure to pass this list around and repost so that everyone can have a plastic-free Halloween, and we can all do our good deed for the environment this month.